Artist's impression of the Global Positioning System (GPS) satellite. These are made by Lockheed Martin. A Global Positioning System (GPS) satellite on the ground. 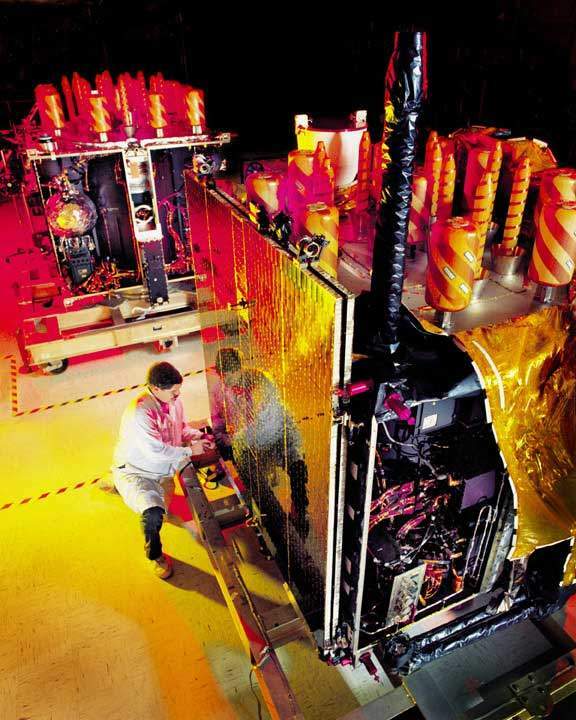 The Global Positioning System (GPS) satellites under construction in the Lockheed Martin facility in Pennsylvania. Lockheed Martin have acquired considerable experience of the satellite industry. The total cost of the GPS programme is estimated at more than $2.5 billion. 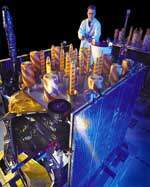 The US Airforce and Missile systems centre chose Boeing to develop and manufacture 33 GPS Block IIF Satellites. 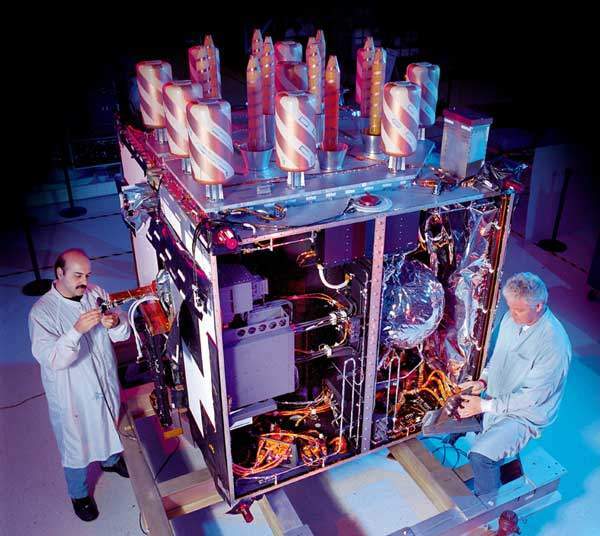 These are being built to replace existing GPS Block I, II, and IIA satellites, the earliest of which went into service in 1978. Delivery of the Block IIF satellites started in April 2001 and will sustain the Global Positioning System constellation, which provides signals for continuous day and night, all weather, three-dimensional positioning for worldwide navigation. The GPS IIF offers flexibility when it comes to evolving user requirements, such as new military or commercial frequencies. Navstar GPS is a satellite-based radio navigation system developed and operated by the US Department of Defense (DOD). GPS allows land, sea, and airborne users to immediately determine their three-dimensional position, speed and time, 24 hours a day, under all weather conditions, anywhere in the world. It consists of a constellation of orbiting satellites, a ground control system and thousands of GPS information receiver units in aircraft, ships, land vehicles and hand-held manpacks. The system achieved full operational capability on July 17 1995. GPS is used to aid land, sea and airborne navigation, geographical exploration, cartography and geodesy, surveying, vehicle location systems, search and rescue operations, aerial refuelling and rendezvous and a wide range of additional applications. There are also numerous civilian users, such as trucking fleets, commercial airlines and law enforcement agencies. Hikers, farmers and fishermen also benefit from GPS. The military capabilities of GPS were demonstrated in the Gulf conflict, cited by US defence officials as a key factor in the successes of operations Desert Storm and Desert Shield. The space segment of the GPS programme consists of 24 operational satellites in six circular orbits at an altitude of 20,200km (10,900nm), with a 12 hour period, at an inclination of 54.8°. The satellites are positioned so that at any one point in time, six of them will be in view to users anywhere in the world. Position and time data is continuously broadcast to users all over the world. The Block IIF satellites will broadcast on 2 L-band frequencies. The Control Segment consists of a master control station operated by the 2nd Satellite Control Squadron at Falcon Air Force Base, Colorado, with five monitor stations and three ground antennas dispersed globally. The monitor stations track all GPS satellites in view and collect information from their broadcasts. The monitor stations send the information they collect from each of the satellites back to the master control station, which computes precise satellite orbits. The information is then formatted into updated navigation messages for each satellite. The updated information is transmitted to each satellite through the ground antennas, using an S-band signal. The ground antennas also transmit and receive satellite control and monitoring signals. 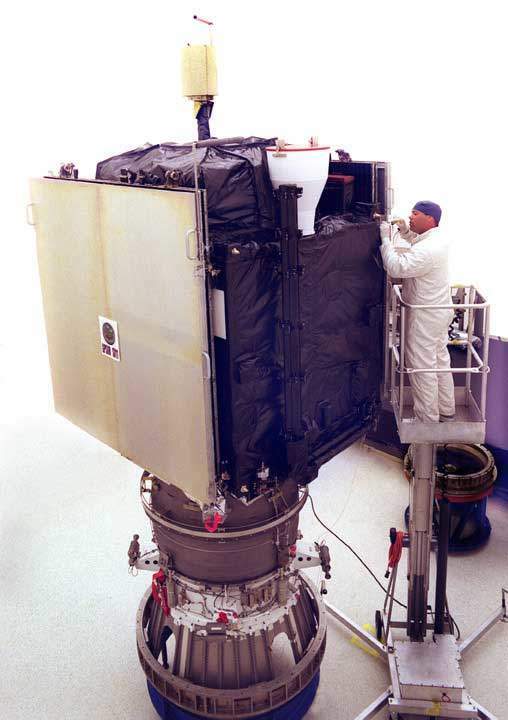 Boeing GPS Block IIF’s partner Computer Sciences Corporation began assuming responsibility for the operational control segment in 2000. The User Segment consists of the signal receivers/processors, antennas and control/display units that allow land, sea, or airborne operators to receive the GPS satellite broadcasts and compute their precise latitude, longitude, altitude, precise time and velocity at any time, in any weather. The system can accommodate an unlimited number of users without revealing their positions. The Delta II expendable launch vehicle is used to launch GPS satellites from Cape Canaveral Air Force Station, Fl. Block IIF spacecraft will use the Air Force’s planned Evolved Expendable Launch Vehicle (EELV). Under management of a Joint Programme Office at the US Air Force’s Space and Missile Systems Centre, Los Angeles Air Force Base, Calif, Boeing Reusable Space Systems designed, built, and tested eleven developmental Navstar GPS satellites and developed and qualified a second-generation production prototype. 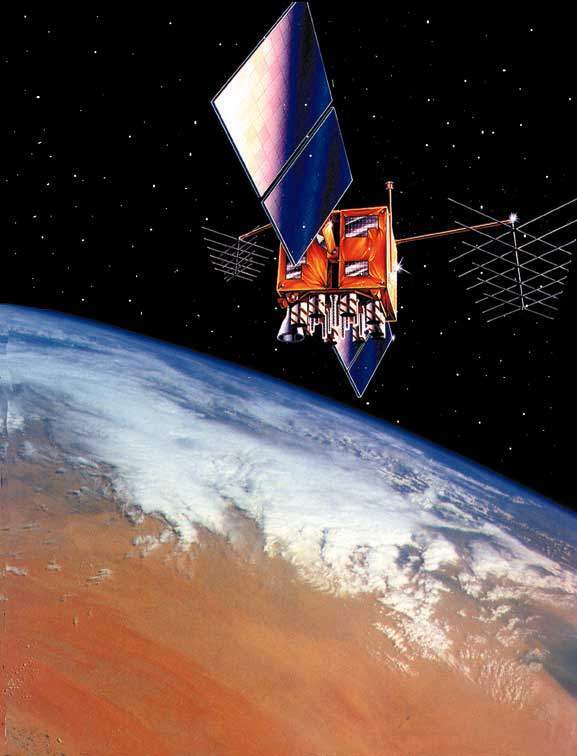 33 production Navstar GPS satellites were constructed under a $1.35 billion contract awarded in 1983. Production lasted until early 2000.